Throughout history, Christianity has come under fire for holding to a standard the culture abandons. Today's headlines increasingly reflect the pressure that comes as warning shots across the bow before the full-on attack of persecution begins. The movie "God s Not Dead" gave us a front row seat to the one-on-one debate regarding the existence of God between atheist Professor Radisson and Christian university student Josh Wheaton. Now in "God s Not Dead 2" the stakes are much higher than a college course as high school history teacher Grace Wesley becomes the pawn in an epic court case that has the potential to cripple free speech rights for Christians. An innocent question regarding Jesus from 16-year-old student Brooke Thawley ignites a firestorm on faith from Grace s accurate answer. 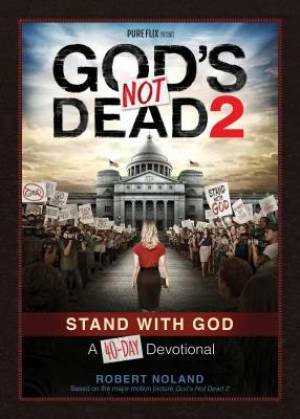 The "God s Not Dead 2" "Devotional" book digs deeper into the cultural questions of civil disobedience and religious freedom, coupled with the sovereignty of God and the Biblical heroes who have traveled this road before us. This 40-day journey will inspire, motivate, and challenge you to not only grow closer to God, but also deepen your roots to stand strong in the storms that life will surely bring. And once again, we shall see God is not dead He s surely alive!" God's Not Dead 2 by Robert Noland was published by BroadStreet Publishing in April 2016 and is our 32984th best seller. The ISBN for God's Not Dead 2 is 9781424551989. Be the first to review God's Not Dead 2! Got a question? No problem! Just click here to ask us about God's Not Dead 2.